Main Attractions: Spectacular waterfalls, gorges, granite cliffs, scenic views, river walk, side trails. Bash Bish Falls might be the most spectacular waterfall in the state Massachusetts. It's literally located on the state line of NY and MA in Mt. Washington, MA. (It's a thirty second drive up from Taconic State Forrest which is in Copake Falls, NY.) Bash Bish is an all-star attraction guaranteed to satisfy. The falls plummet through a series of dramatic gorges before finally cascading about 80 feet into sparkling pools of water. Even if there hasn't been much rain, Bash Bish is still a picturesque scene but when it has received a lot of rain or snow melts it's unlikely you'll see a better waterfall in all of New England. The trail leading up to Bash Bish Falls runs along the river that flows out and away from the falls. It's a great way to get some exercise and adds a little drama to the experience since you can hear the falls get louder and louder as you close in on them. The hike from the main entrance to the falls is a moderate distance, fairly easy for those in relative good shape. On the day I was there, small children with their grandparents had made it to the falls without any problems. There is a second way to experience the falls by descending the blue trail system to the falls. This north entrance above the falls is about a mile from the main entrance on the right hand side. You can't miss the parking lot and cutout from the road. Warning: Although this area offers a great view of the surrounding area and unique views of the falls from above, it's also potentially dangerous as the small summit is jagged rock and can be very slippery. The DEM have constructed a strong wire fence to keep folks away from the sheer drop offs, but it's still a scary place to bring children or anyone who is a novice hiker. If you try the upper north entrance and it's your first time there, please be very cautious with each step you take. You could be critically injured...or worse...if you got too close to an edge. Please stand back and enjoy it what is presented to you...don't go that extra 10 feet just for the thrill. 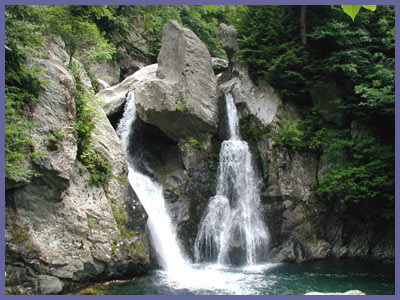 Bash Bish Falls is a great place to explore a running river ecosystem and picturesque waterfalls as they tumble through a deep green forest. As noted before, any waterfall is best experienced if the region it's located in has received a decent amount of rain or snow melt. Directions: For those coming from Connecticut or NYC area it's best to get on Rt. 22 north as it heads up New York along the Connecticut/Massachusetts border. Keep on Rt. 22 north and you'll eventually come to Copake, NY which is located where New York, Connecticut, and Massachusetts borders meet. 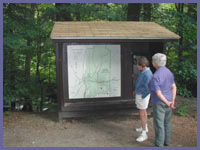 Proceed through the town of Copake and soon you'll approach the town of Copake falls. As you near Copake Falls, Rt. 344 east meets Rt. 22. Take a right onto Rt. 344 (east) and follow the signs for "Taconic State Park" The entrance to Taconic State Park is on your left and the entrance to Bash Bish Falls is about a mile up the road from Taconic State Park. (After you pass the entrance to Taconic State Park the road comes to a fork. Bear to your left at this fork following the signs to the entrance of Bash Bish Falls.) You can also visit the official website for Bash Bish and get directions or other info from there.